The congregation is starting the process of selling its west side church property to help fund its service to the community. 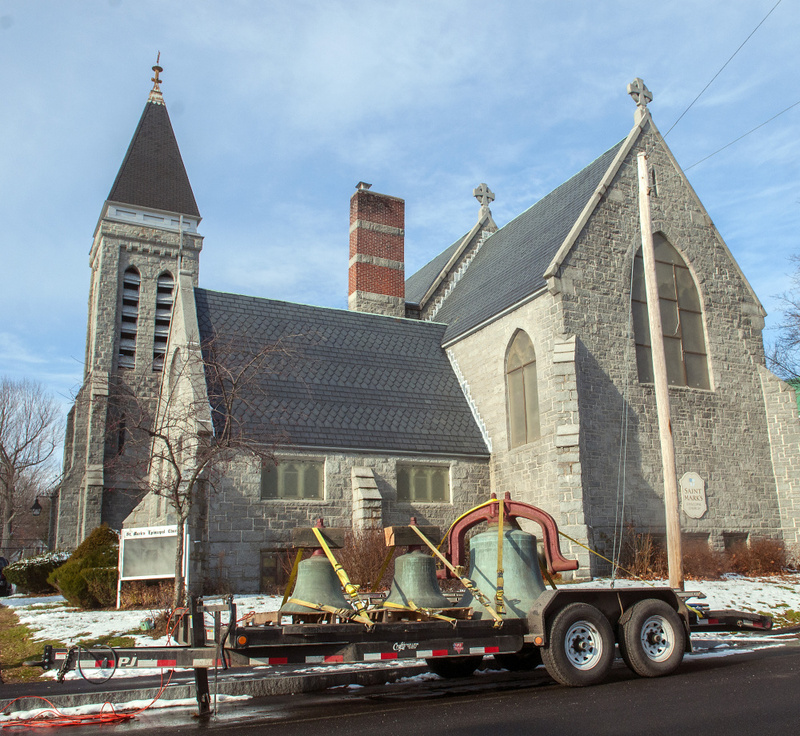 AUGUSTA — The bells sitting on a flatbed trailer Thursday outside St. Mark’s Church were a sign that change is nigh. For 130 years, the granite Gothic Revival building between Summer and Pleasant streets, along with the rectory and its parish hall, was home to the congregation of the Episcopal church, which has been in Augusta for 175 years. But now, with the congregation relocated to Augusta’s east side for nearly two years, and the church real estate expected to be listed for sale later this month, parts of the church, like the bells, are starting to find their way to other churches across the country. Next week, the Tiffany stained glass window will be removed; and in the spring, other stained glass windows will be taken, along with pews, the organ and anything else the Larchmont, New York-based Adrian Hamers Inc., can find a market for. 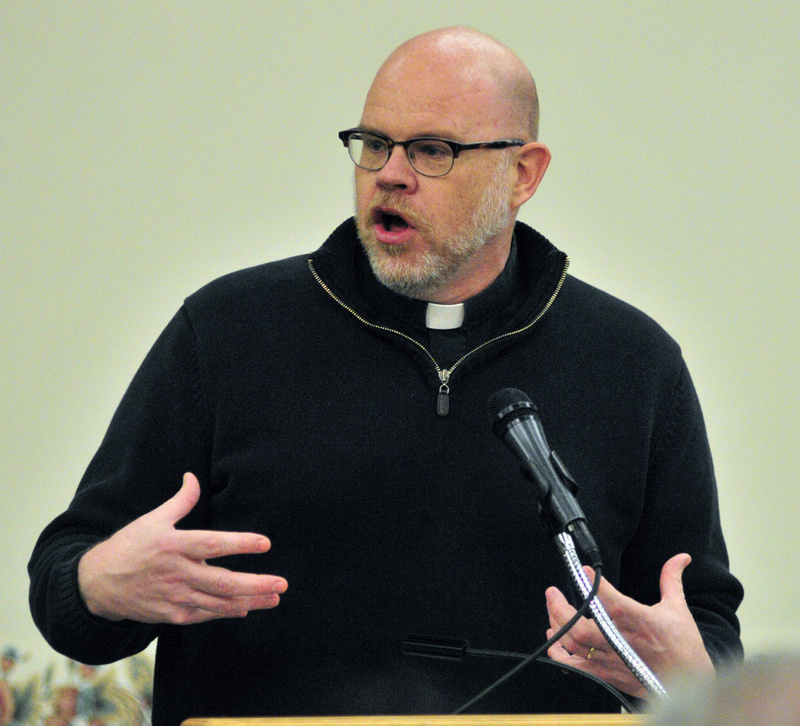 St. Mark’s congregation is passionate about working in the community. Last weekend, the Everyday Basics Essentials Pantry served 407 people in the community by providing items such as toiletries. In addition to the pantry, the church also operates Addie’s Attic Clothing Bank and the Augusta Food Bank. The three church buildings, tucked between the newly renovated and expanded Lithgow Public Library and a residential neighborhood, will be listed together, although there will be an option to sell the rectory separately, Karas said. The fate of the buildings has been the source of speculation in Augusta for months. In July, rumors that the property would be purchased by the Bread of Life Ministries, which operates a homeless shelter on Hospital Street and a soup kitchen on Water Street, prompted city officials to propose a moratorium and changes to clarify the city’s zoning rules to prevent uses such as homeless shelters and soup kitchens in some areas. In August, the temporary ban on group, boarding and rooming homes was put in place. At that time, John Richardson, executive director of Bread of Life Ministries, said it was too early to comment. On Thursday, he said his organization is considering buying the St. Mark’s property. Services were last held in the building two years ago. Following Christmas celebrations in 2014, the congregation made the move to east Augusta, sharing worship services and clergy with Prince of Peace Lutheran Church at 209 Eastern Ave.
Now, Karas said, St. Mark’s is in the process of becoming a combined federated congregation with the members of Prince of Peace. That means the church will have a single congregation that is both fully an Episcopal Church and an Evangelical Lutheran Church in America. In 1999, the two Protestant denominations agreed to full communion. The combination of the two congregations, which Karas serves equally, has been like a marriage; and like a marriage, there has been a combining of worldly goods, and in that way, some of the traditions of St. Mark’s live on. The baptismal font, the paraments — the seasonal cloths that adorn altars and lecterns — a Nativity set, an Advent wreath and all of the vessels required to serve Communion have been moved to the Church at 209. The St. Mark’s church parlor, the Farnham Room, has been relocated and recreated with its furnishings on Eastern Avenue, he said. As furnishings have merged, so have missions. In addition to what St. Mark’s has brought, the Prince of Peace congregation holds a Christmas supper for the community. “We are stronger than the sum of our parts” Karas said. 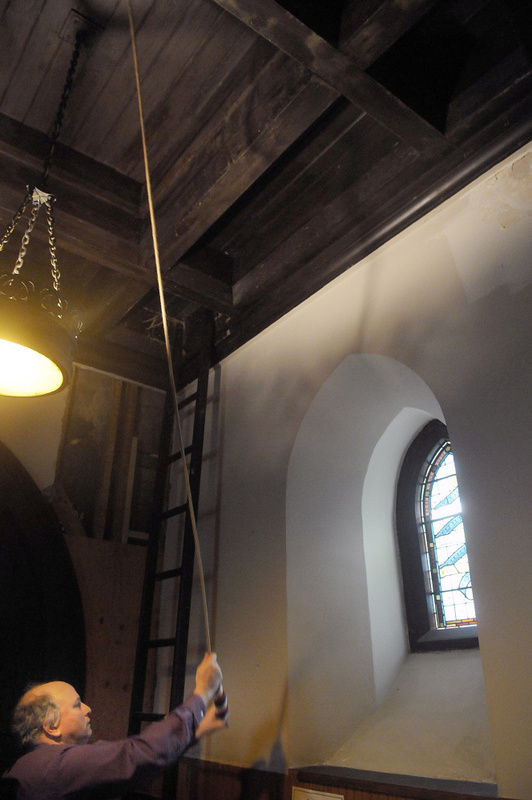 One of St. Mark’s 12 bells, the service bell that dates back to the days of a wooden church that burned down before the 1886 building went up, also will stay with the congregation. 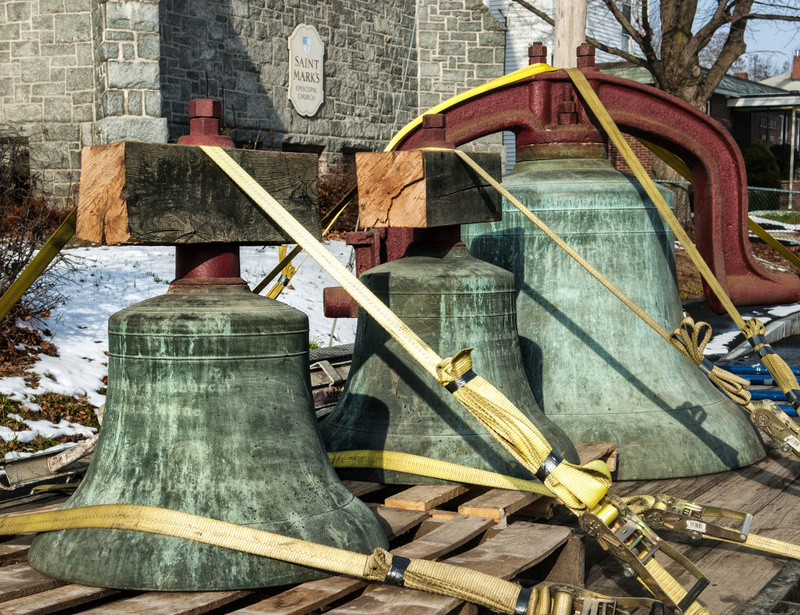 The remaining 11 bells, part of a carillon that played music from the bell tower, will play somewhere else. For Jim Melcher, who has been a member of St. Mark’s for more than 17 years, the changes are hard to see. “Those bells were known as the Kling bells,” Melcher said. They were given to the church in memory of Ellen Kling in 1925. “There’s a plaque there that says something like, ‘These bells will ring when my voice is still,'” Melcher said. While it’s sad to let go of the church, which was listed in the National Register of Historic Places in 1984, Melcher said any church has challenges in keeping its ministries afloat. Kennebec Journal Staff Writer Charles Eichacker contributed to this report.